The Greenery recommends using either pine straw or quality shredded pine bark mulch. Pine bark nuggets will float away after heavy rains and don’t break down quickly to enrich the soil like shredded pine bark mulch does. 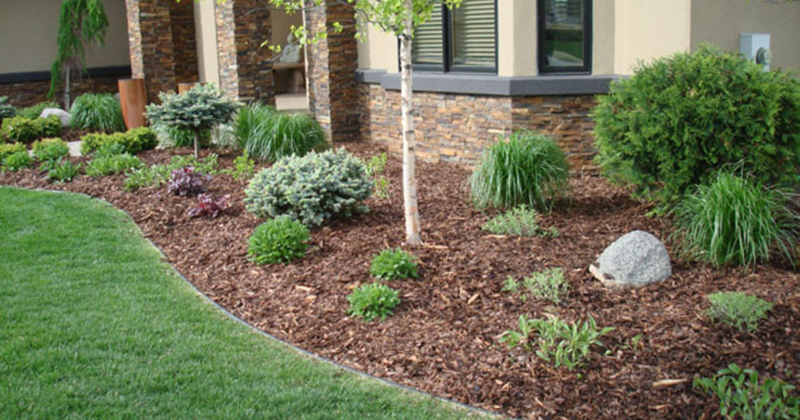 Natural pine bark mulch is a sustainable product that is a byproduct of the lumber industry. In addition, it does rot over time, which is beneficial to the plants it protects. Dyed mulches (black, red, gold, dark brown and other colors) are often made up of recycled wood waste from old decking, hardwood pallets or old demolished buildings. This ground up trash wood is then sprayed with a tint to cover up inconsistencies in the wood and give it a uniform color. These dyes are said to be harmless, but can stain sidewalks and driveways. Some colorants may not be so harmless. For example, black mulch may contain “carbon black”, which is often made by burning coal tar or various oils. This dyed wood mulch does not break down to enrich the soil as a good mulch should. Instead it leaches the dye along with the possible contaminants (chromium, copper, arsenic and others) into the soil, harming or even killing beneficial soil bacteria, insects and earthworms. Colored mulches have been found to slow the growth of established plants and even kill new plants by tying up the available nutrition in the soil, a process known as “nitrogen immobilization”. Cypress mulch isn’t what it’s made out to be. Its popularity is based on the idea that cypress mulch contains chemicals that fend off insects and resist rot. This was the case back in the days when the mulch was made from mature, century old trees. The demand for cypress timber and mulch has led to overharvesting, so much so that most cypress mulch now comes from immature trees that have not yet developed the properties that made the mulch desirable in the first place. Cypress groves thrive where lowlands meet the ocean, and they protect inland areas from storm surges and protect the local flora from invasive species. Few groves will ever grow back once harvested. Mature cypress trees can live to be more than 1000 years old, but their seedlings need the silt from freshwater floods to survive. After more than a century of dam building and flood control, very little new silt makes it into the cypress groves anymore. According to the Louisiana Forestry Association, loggers are erasing up to 20,000 acres of cypress every year. At that pace Louisiana’s best defense against hurricanes will be gone in less than two decades.